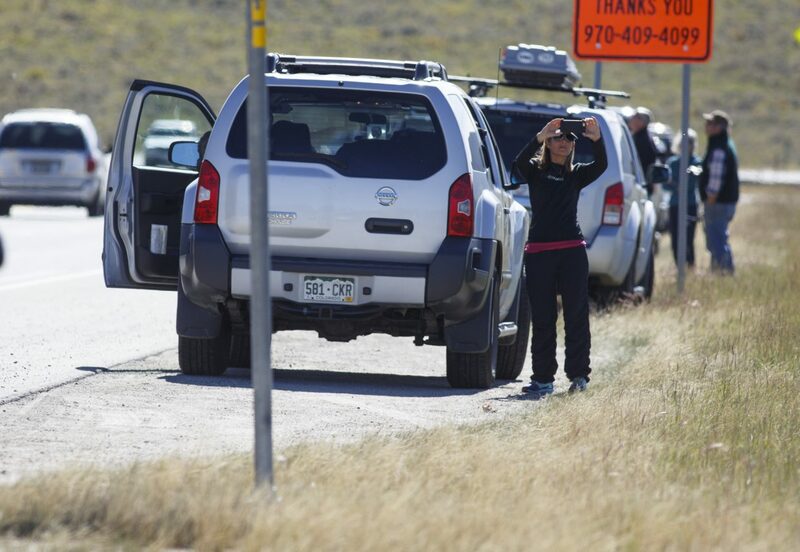 Passing motorists pull over along Highway 6 to take photos of the Tenderfoot2 Fire Tuesday, Sept. 19, in Dillon. 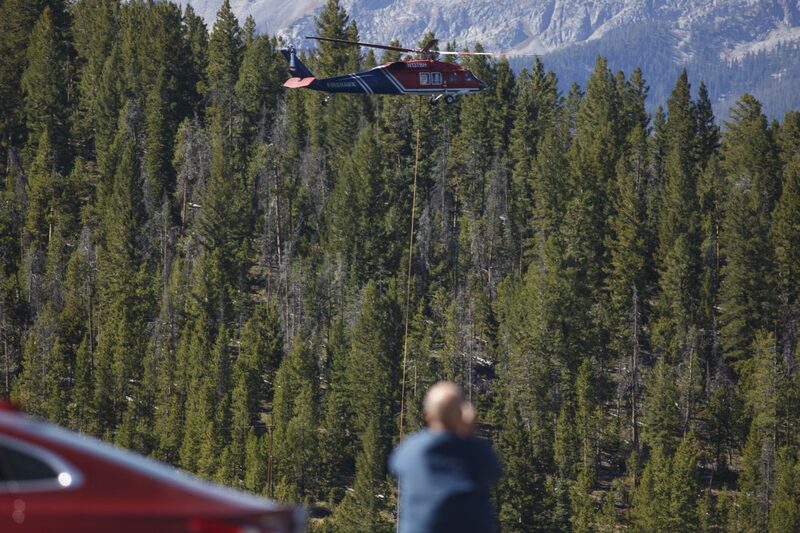 Water buckets refill by helicopter in the Dillon Reservoir to fight the Tenderfoot2 Fire Tuesday, Sept. 19, in Dillon. 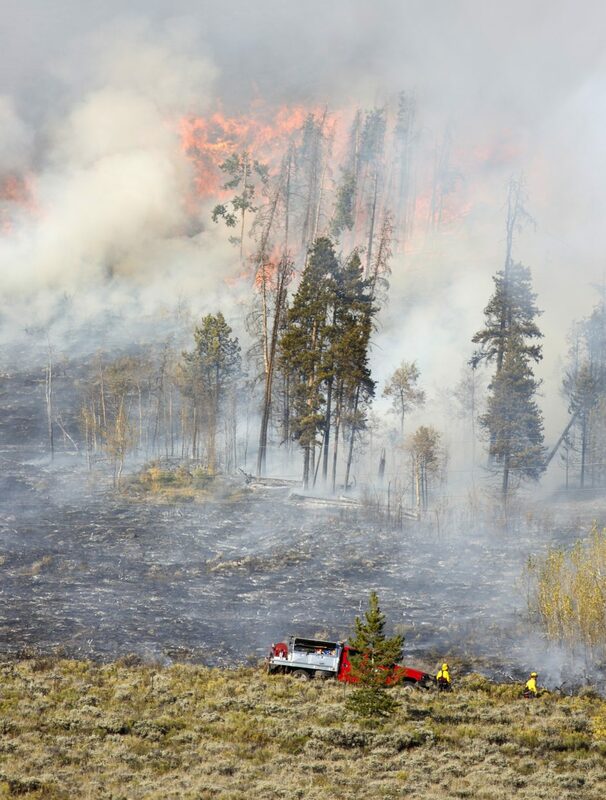 A passing motorist stops to take photos along Highway 6 of the Tenderfoot2 Fire Tuesday, Sept. 19, in Dillon. 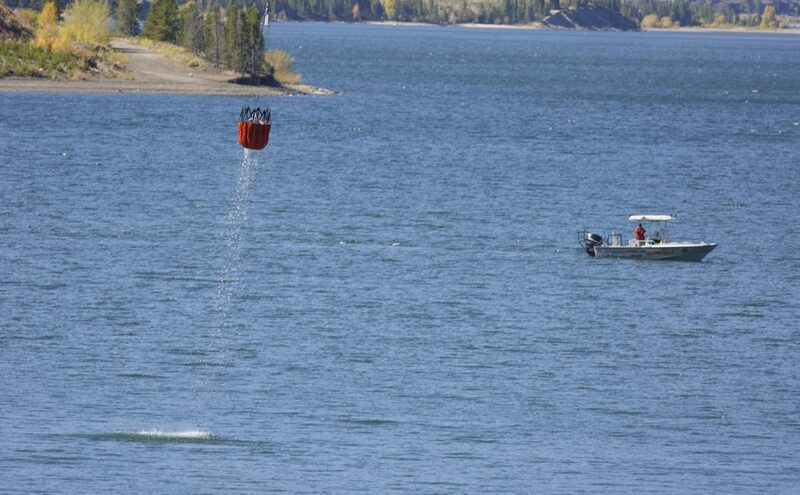 Water bucket enroute to Tenderfoot2 Fire Tuesday, Sept. 19, in Dillon. 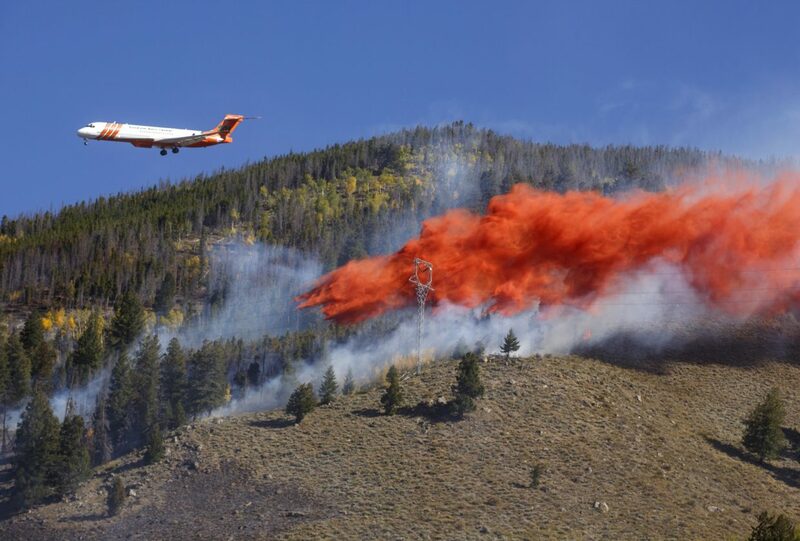 An air tanker dumps fire retardant slurry onto Tenderfoot2 Fire Tuesday, Sept. 19, in Dillon. 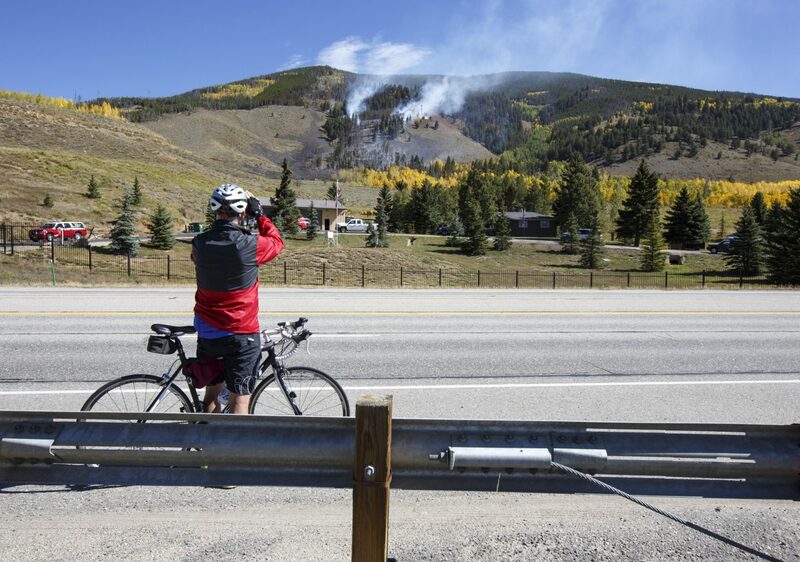 A passing cyclists stops to take photos along Highway 6 of the Tenderfoot2 Fire Tuesday, Sept. 19, in Dillon. 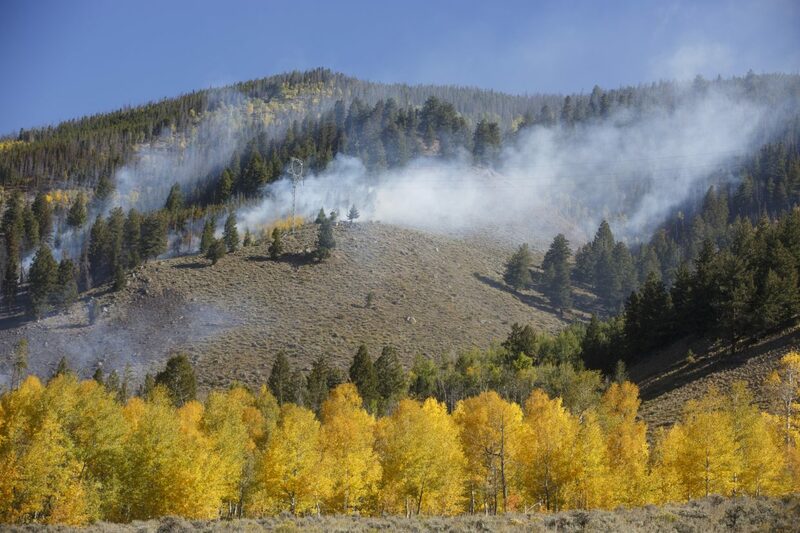 A wildland fire along Tenderfoot Trail Monday, Sept. 18, in Dillon. 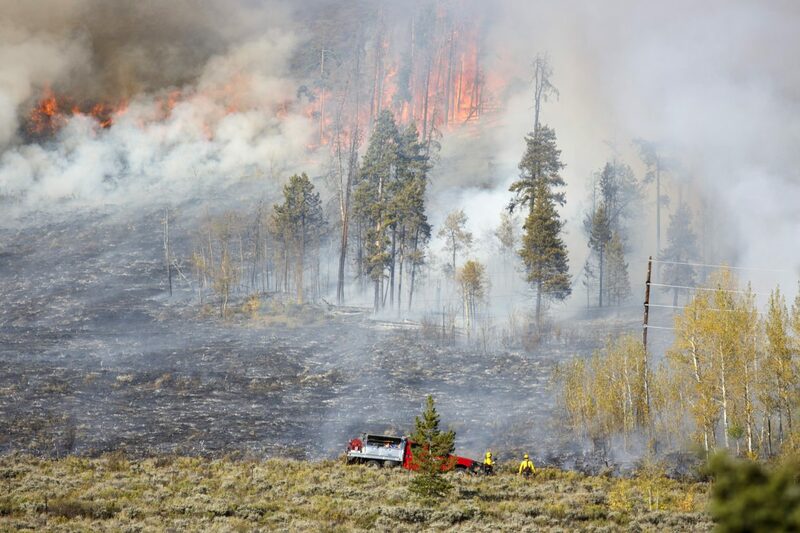 Wildland firefighters battle a fire along Tenderfoot Trail Monday, Sept. 18, in Dillon. 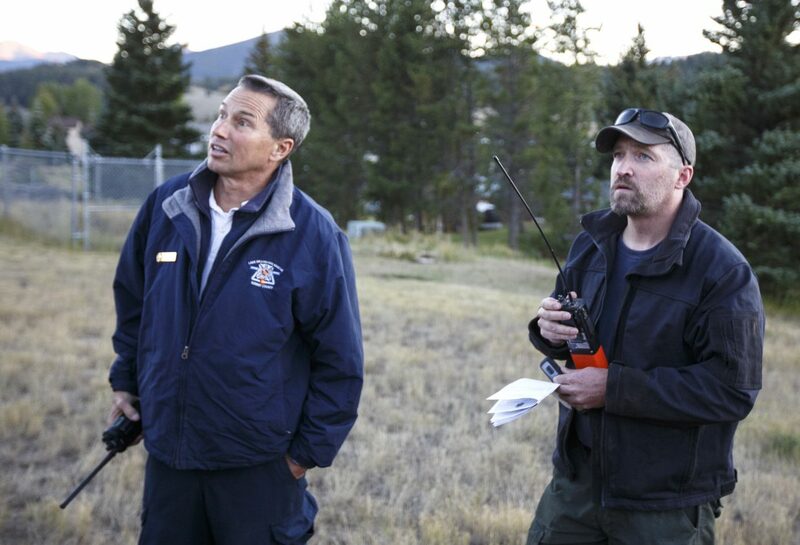 Fire officials discuss during a woodland fire Monday, Sept. 18, in Dillon. 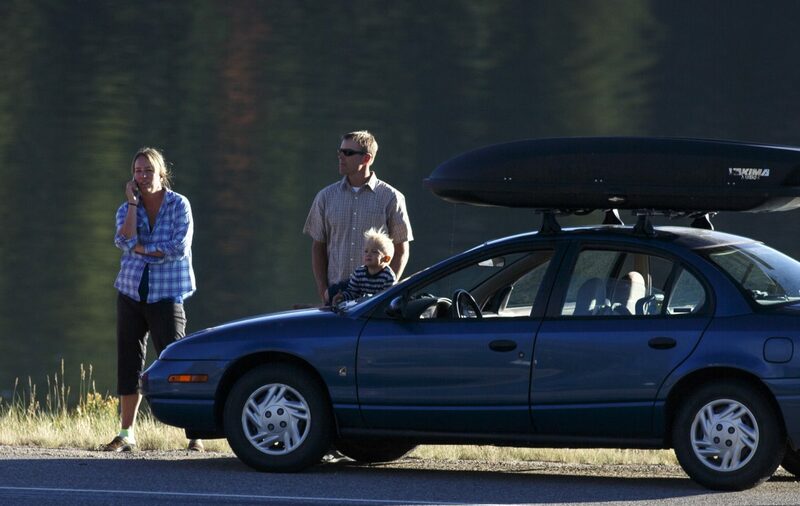 Passing motorists watch from Highway 6 as the Tenderfoot Fire grew Monday, Sept. 18, in Dillon. 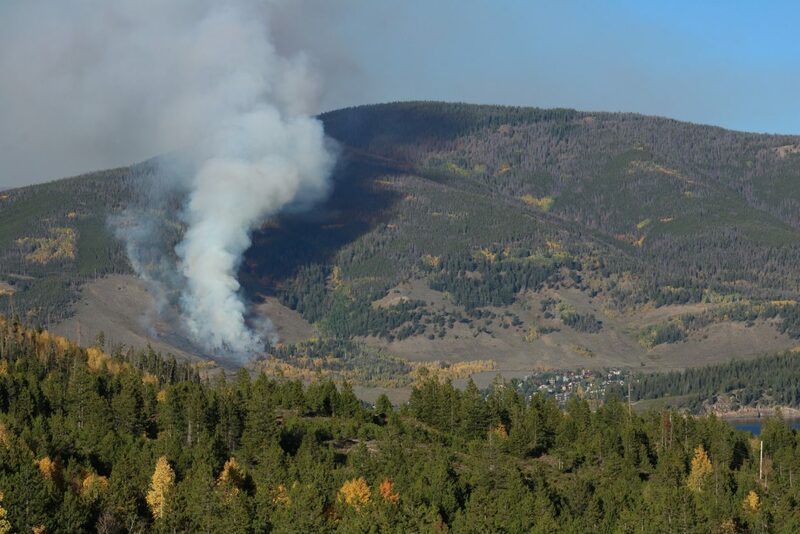 Tenderfoot2 Fire Tuesday, Sept. 19, in Dillon. 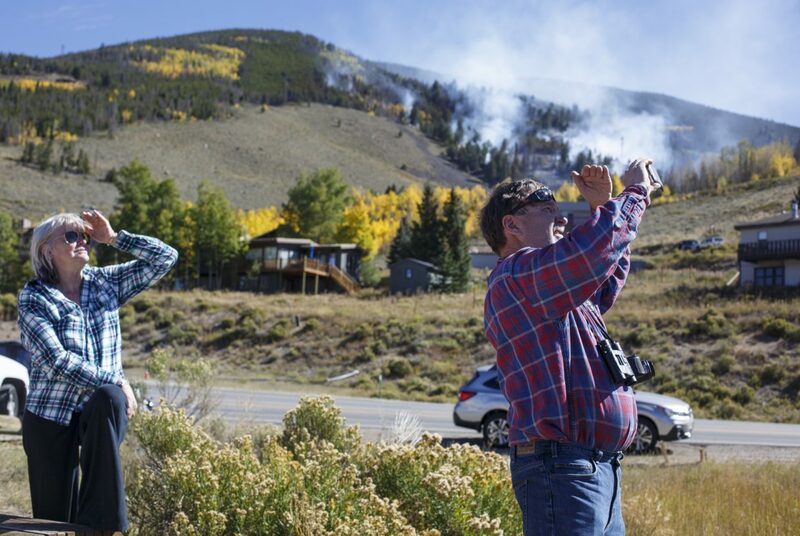 Silverthorne residents Marleen Goodman, left, and Dan Moroz take photos of helicopter action along Highway 6 of the Tenderfoot2 Fire Tuesday, Sept. 19, in Dillon. 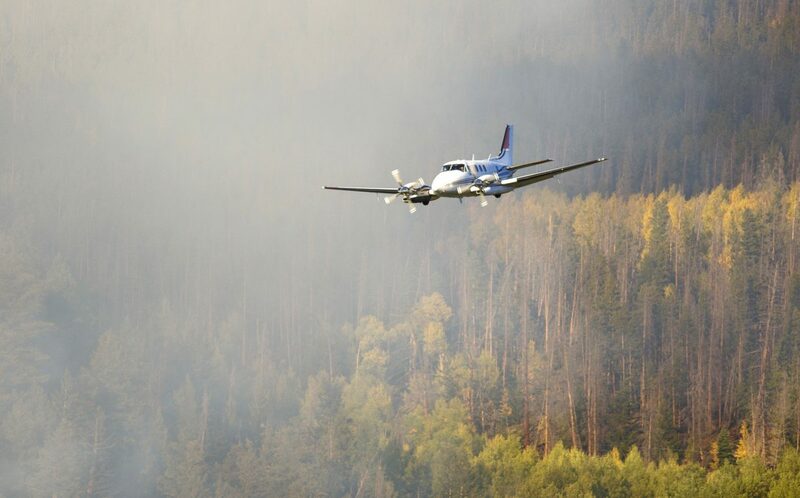 A spotter aircraft flies by the Tenderfoot Fire Monday, Sept. 18, in Dillon. 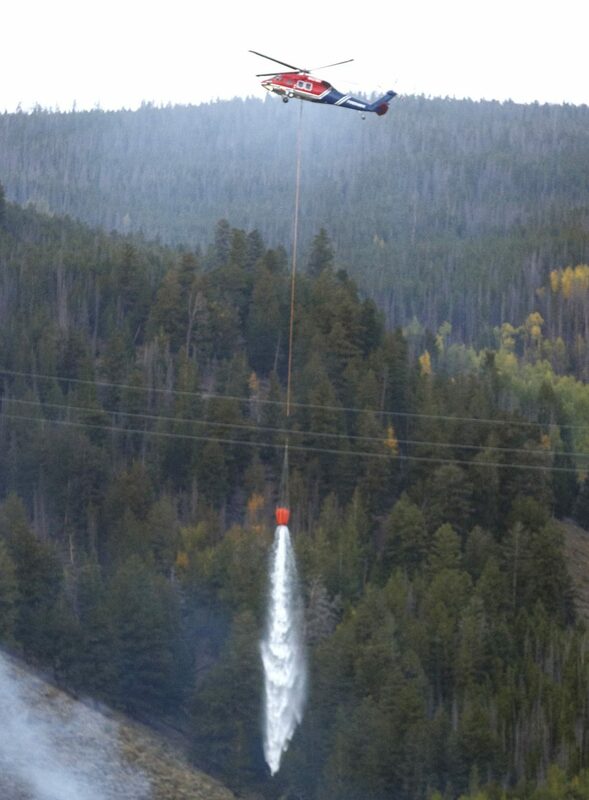 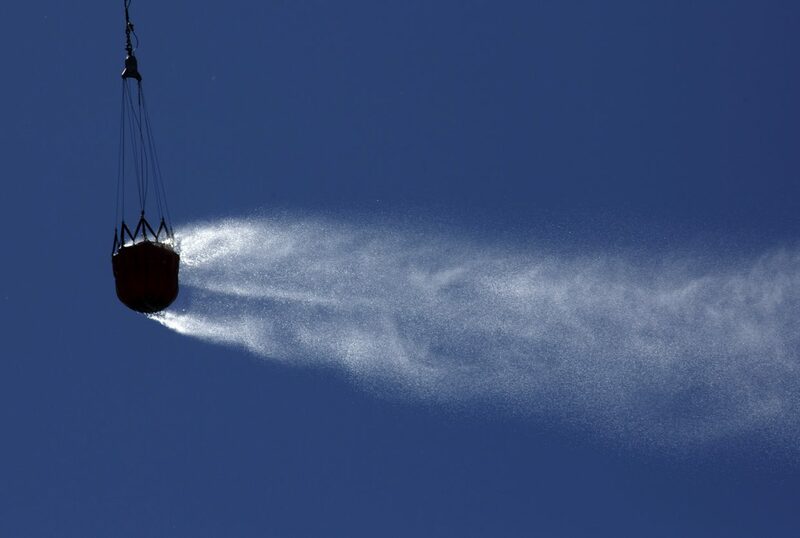 A helicopter drops off water onto the Tenderfoot Fire Monday, Sept. 18, in Dillon. 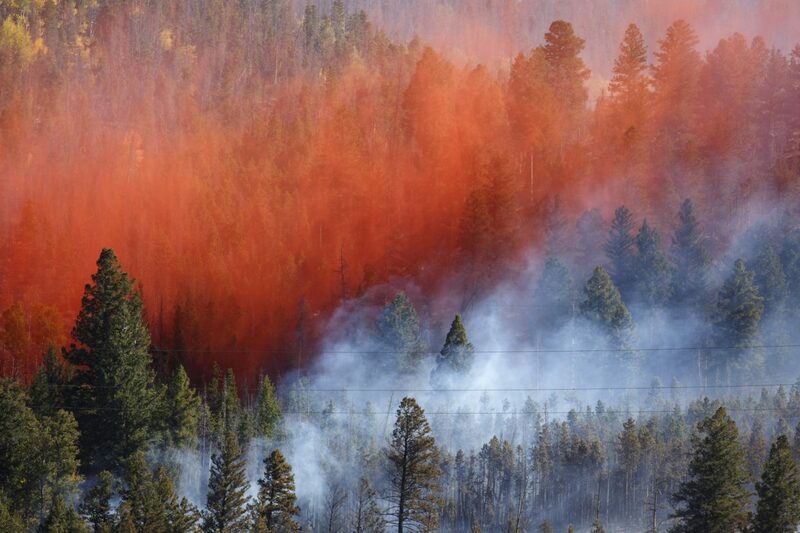 Water buckets dumped onto the Tenderfoot2 Fire Tuesday, Sept. 19, in Dillon. 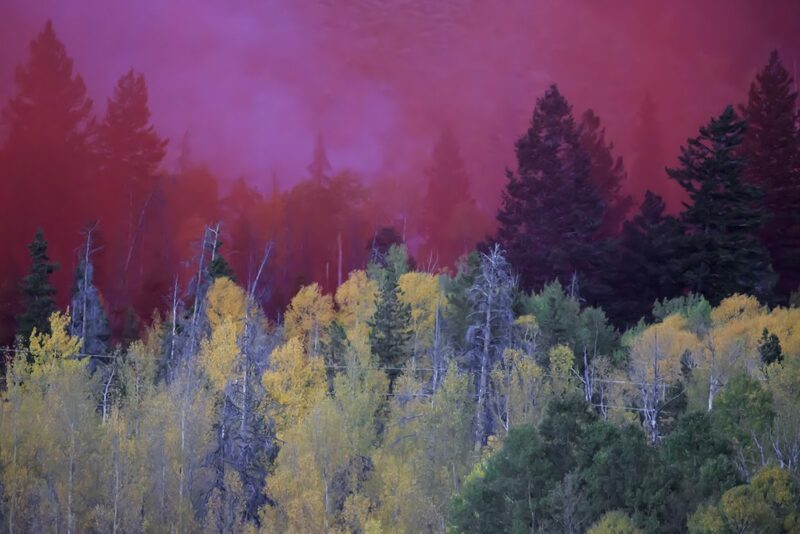 Red slurry in mix of a wildland fire along Tenderfoot Trail Monday, Sept. 18, in Dillon. 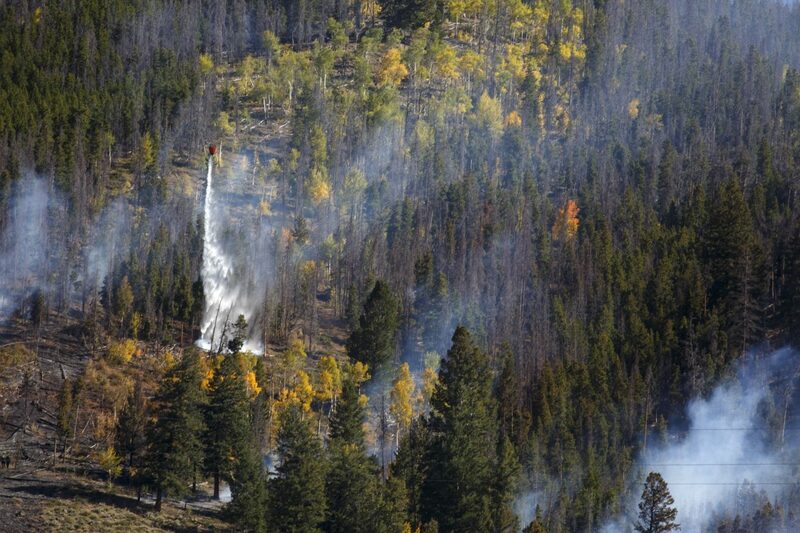 A wildland firefighter plan drops slurry on a fire along Tenderfoot Trail Monday, Sept. 18, in Dillon. 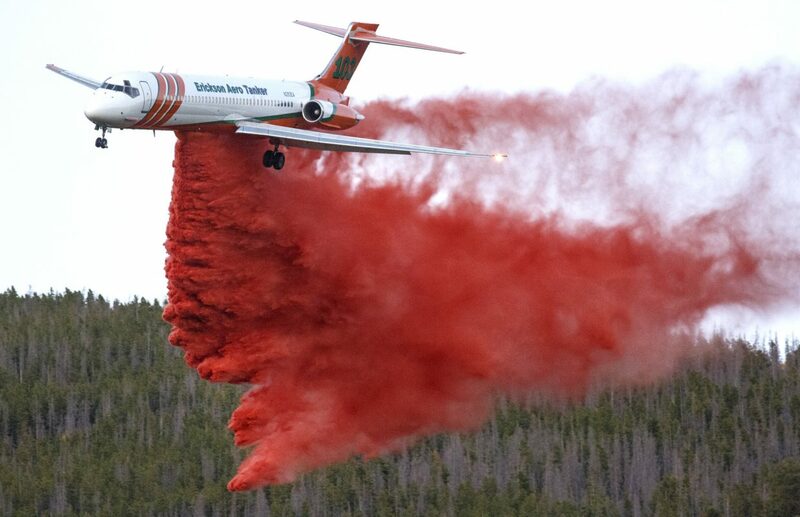 Fire retardant slurry dumped by an air tanker spreads onto Tenderfoot2 Fire Tuesday, Sept. 19, in Dillon. 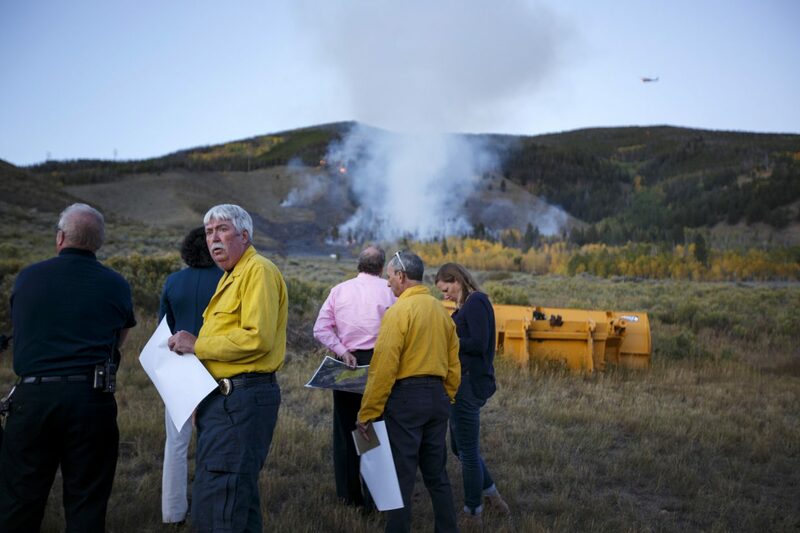 Passing motorists stop to take photos of a wildland fire near Highway 6 Monday, Sept. 18, in Dillon. 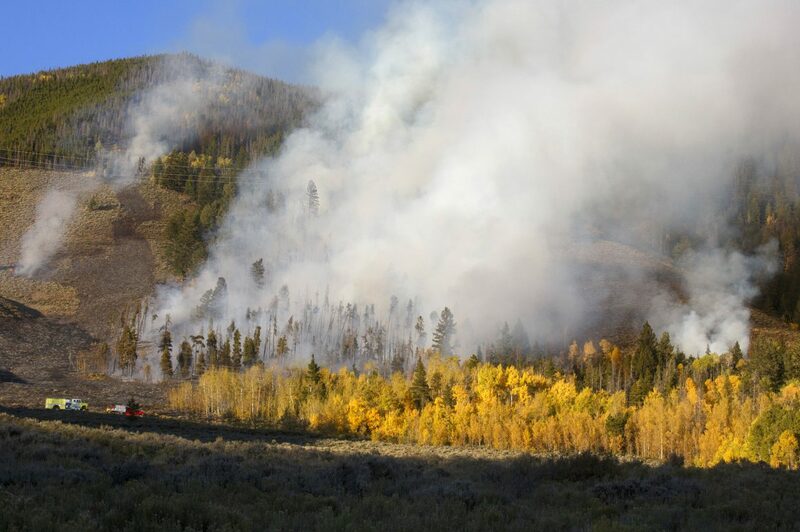 The fight against the Tenderfoot2 Fire continued Tuesday morning, with additional crews en route, two heavy tankers dropping flame retardant slurry and two helicopters dropping water buckets. 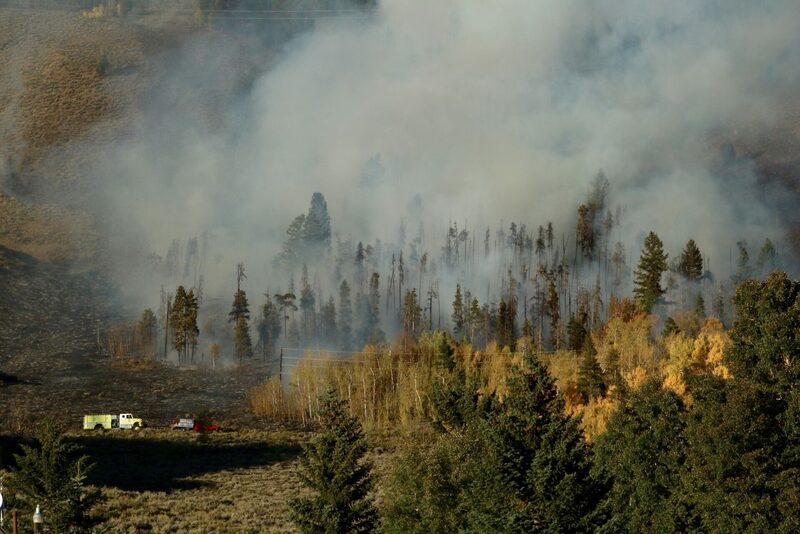 The cause of the fire, which has now burned roughly 25 acres, is still under investigation. 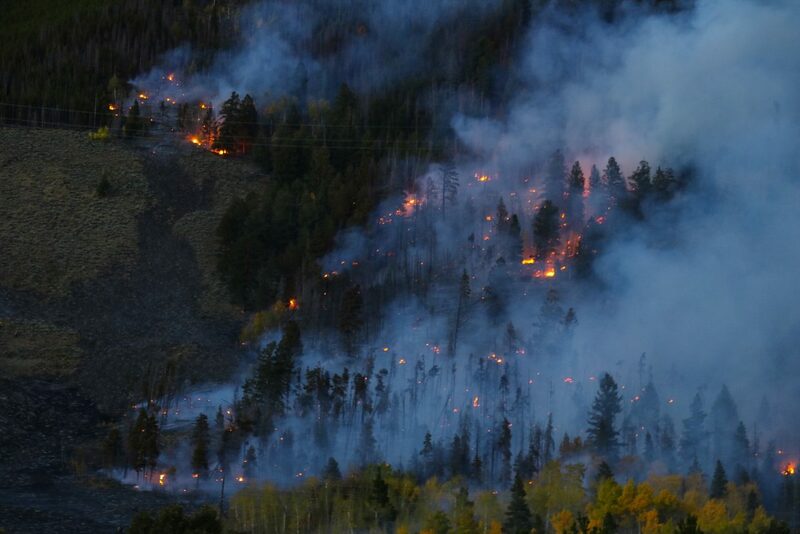 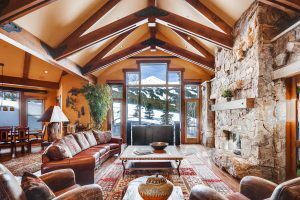 It has burned mostly sage and heavy timber, including significant amounts of standing dead beetle kill. 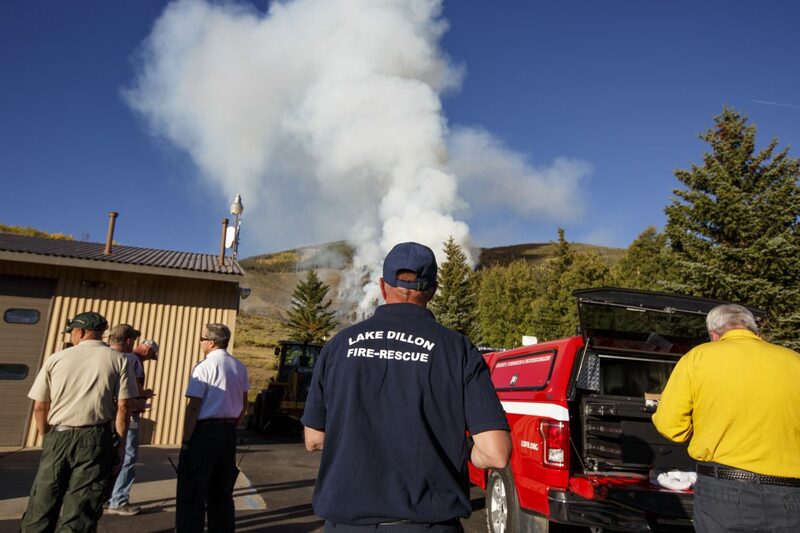 The fire started late Monday afternoon directly behind a water treatment plant on U.S. highway 6 in between Dillon and Keystone in the Oro Grande Trail area. 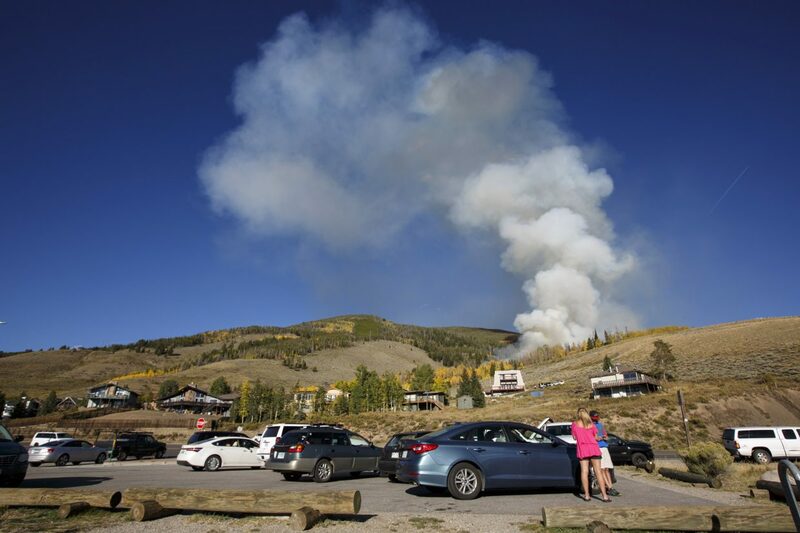 The U.S. Forest Service will be closing trails in the area between Straight Creek Road and Frey Gulch Tuesday, along with the entire Tenderfoot Trail system. 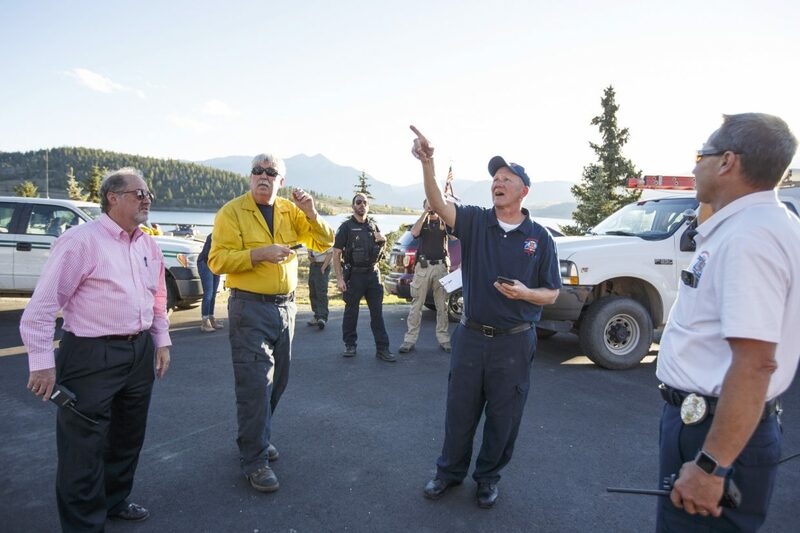 In addition to crews from Lake Dillon Fire-Rescue, three U.S. Forest Service engines are responding along with a 20-person hand crew from Rifle and an initial attack hand crew from the Upper Colorado River. 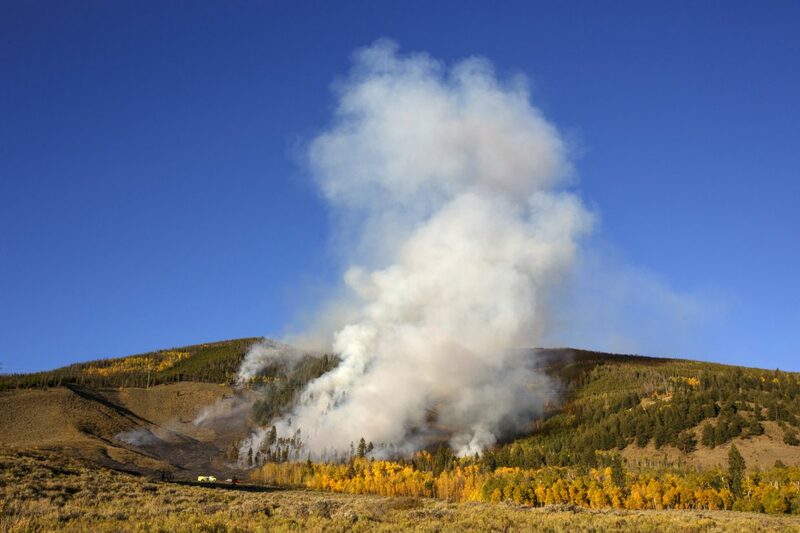 There was very little fire activity overnight, however red-flag warning winds are expected by the late morning and mid-afternoon, which could whip up the fire. 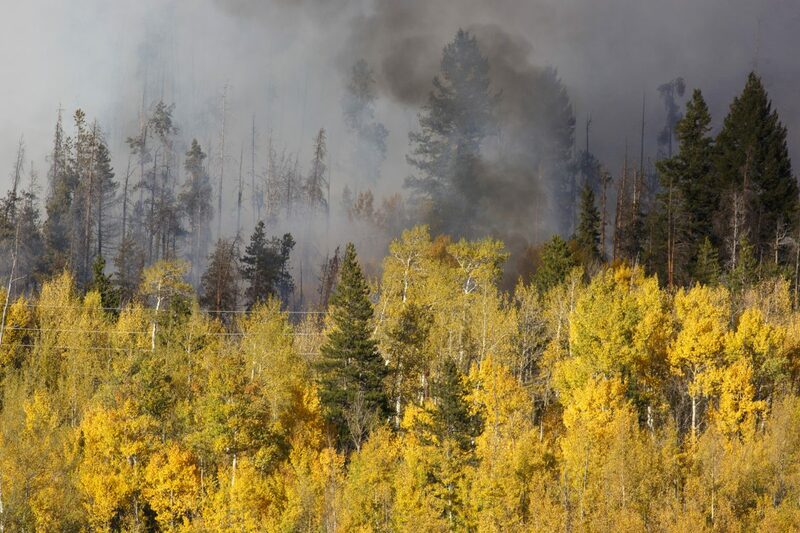 Should it make a big run, the Corinthian Hills and Oro Grande neighborhoods could be at risk, although on Tuesday morning no evacuations had been ordered. 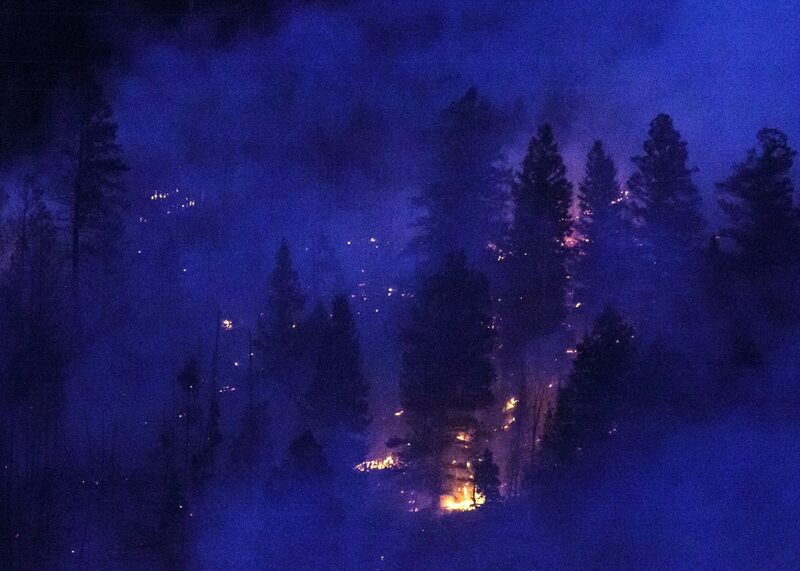 The fire is also directly threatening a major power line and microwave communications repeater.